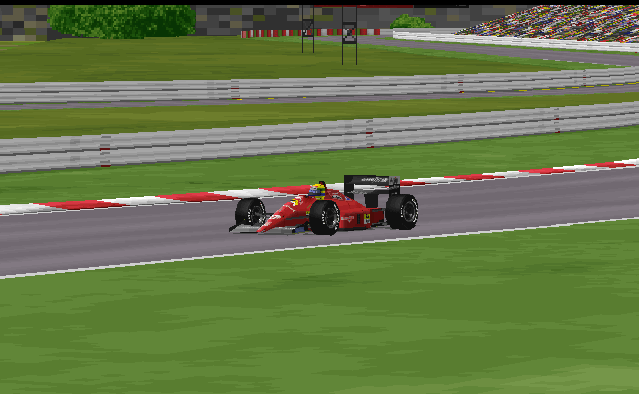 Senna on his way to a dominant win following a amazing display in Suzuka. Following a rather close qualifying, the race was heading onto be a two-way battle between the two McLaren drivers. However, early on, Jeremy-Etienne Voeckler had a puncture which forced him to retire despite a really good day up until that point. However, more embarassing was the way his teammate retire; thinking he could pass a car down the outside of the last corner, he ran wide and crashed into the wall. Thus, it was then Ferraris game to lose, and given the gap they pulled, it was really hard unless they crashed out, which they didn’t. The Arrows took the remaining 3-4, and it was battle between Brundle’s Tyrrell, Nicchi’s Zakspeed, and the Minardis and AGS cars, of which the first two came out with the remaining points scoring positions. Apart from the abovementioned Voeckler, Mansell and Modena’s Osella also suffered punctures throught the race, in the case of Mansell was ending an otherwise decent race from the Brit. Despite their retirements, the McLaren drivers are the only two contenders for the title going into Australia, as although Prost does have a chance at getting it, he has to drop a score due to the 11 best results rule. Infinite Improbability Drive Of The Race: Martin Brundle – another points finish to help his team in the WCC. Reject Of The Race: Goodyear – can’t make tyres that last race distance, it seems.